The eye is the lamp of your body; when your eye is clear; your whole body also is full of light. 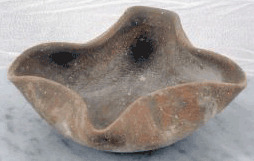 Luke 11:34; A full-size, authentic replica of the earliest and most traditional Holy Land Oil Lamp. Such lamps were used to light the people's homes and synagogues from the time of the Patriarchs until after the Disciples. Formed from the very earth of the Holy Land, these Canaan Lamps recall the generations of the Bible right in your home. Like their biblical originals, these fully-functional, reproduction terra-cotta lamps come unglazed and can be used with any common cooking oil. Olive oil, the choice oil of the ancient people of the Holy Land, produces an especially beautiful golden glow.